We are now investigating Feature 41 (F.41), the 1863 latrine from Block 6 at the site, and I thought I would give you some background on the excavation of it. As you can see from the plan map, we found three latrines in 1995 and 1996, all inside of the original wall for the prison. Feature 19 is the first latrine, used in April 1862. Feature 40 we suspect was the second latrine used, in very late 1862. Feature 41 was used in the middle of 1863. We started the excavation of this latrine in 1996, when we exposed most of it and excavated the southern third of it. After we finished the initial investigation that year, we covered the remaining portion of the latrine with plastic and then backfilled the area. The following sequence of pictures takes you through the initial reopening of the area and the excavation of the one 2 m2 unit that had not been excavated previously. Left to right: Staking out the area to be opened up for the excavation of F. 41. Field-school students begin clearing the previously excavated soils above F. 41. Plastic covering placed in 1996 begins to reappear. Left to right: Careful excavation begins in the unit not previously dug. Latrine exposed, photographs taken, and mapping completed. Volunteers working at the latrine this past weekend. We are just beginning the investigation of the latrine. We have only gotten about four centimeters down in the latrine to this point. We have discovered a portion of a yellow ware chamber pot, a toothbrush, several glass vessel clusters, two prosser buttons, and much eggshell. 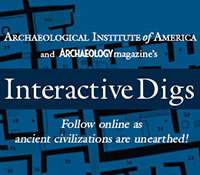 Look for more updates as we proceed with the excavations! This entry was posted on Sunday, June 24, 2007 at 10:43 am	and is filed under Field Reports. You can follow any responses to this entry through the RSS 2.0 feed. Both comments and pings are currently closed. For more on Johnson's Island, see archive.archaeology.org/johnsonsisland. Please visit www.johnsonsisland.com for information on helping protect the site and more. All photos courtesy David Bush unless otherwise noted.